Seattle-based glass artist Ginny Ruffner was at the peak of her career when a car accident almost took her life. No one thought she would ever walk or talk again. But Ruffner fought her way back and has been re-inventing herself, and her art, ever since. Ruffner is one of the best-known glass artists in the United States. Her one-of-a-kind sculptures are vibrant, exquisitely detailed and often humorous. Over the years, she became famous for a technique called lamp working, also known as flame working, which involves using a torch to melt and shape the glass rather than blowing it. But in 1991, at the peak of her career, Ruffner was involved in a three-car collision that almost took her life. She was in a coma for five weeks. "It's scary when you can't talk. It's scary when you can't do what you've done all your life," she says. The award-winning artist was in the hospital for five months and in a wheelchair for five years. However, despite the odds, Ruffner overcame her injuries and, although she still has difficulty walking and talking, has willed herself back to work. 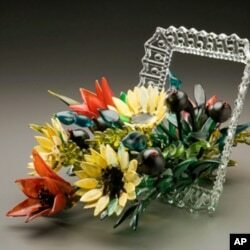 Ginny Ruffner is best known for her intricate glass flowers. She's still creating the glass work that made her famous, but she also paints, draws and creates large-scale sculptures in a variety of mediums. Because her movement is now limited, Ruffner works with a team of artists and designers who help bring her vision to life. She calls it a benign dictatorship. “I’m the one saying green here, yellow there, but they’re the ones who are actually doing it,” she says. She and her team recently finished a 28-foot [8.5 meter] high flowerpot made of steel and aluminum, installed in downtown Seattle. 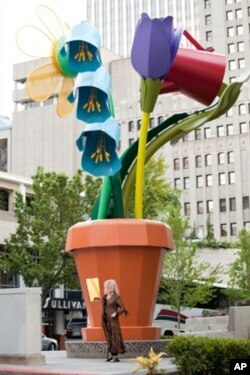 Artist Ginny Ruffner stands in front of her 28-foot [8.5 meter] aluminum-and-steel flowerpot. Seattle, Washington, 2011. And Ruffner hasn’t stood still since. She was recently honored at the Smithsonian’s prestigious Renwick Gallery in Washington, D.C., with a special screening of an award-winning film about her life called “A Not So Still Life, the Ginny Ruffner Story,” by filmmaker Karen Stanton. And, in a current exhibit at the Maurine Littleton Gallery in Washington, art fans were able to see the glass flower sculptures for which she’s famous. Also, a collection of prints and drawings Ruffner says were inspired by scientific readings. “She uses her imagination and her mind to put together shapes and forms and subjects in a way that you haven’t seen,” says gallery owner Maurine Littleton, who has known Ruffner for more than 25 years. It’s been a long journey, but Ruffner says the hardest part has not been the physical challenge. 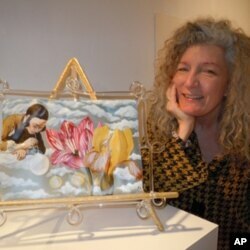 Artist Ginny Ruffner with one of her vibrant glass works. Maurine Littleton believes Ruffner has done more than influence people in a technical way. Ruffner has had 40 solo shows, several hundred group shows, and her work is in 42 permanent collections in museums around the world. However, she feels her best work is yet to come.